Mike is helping me out with a guest post this week. Thanks a lot! Thanks to Rob for allowing me to guest review while he's away from Daily Beer Review. Hope the review lives up to expectations! 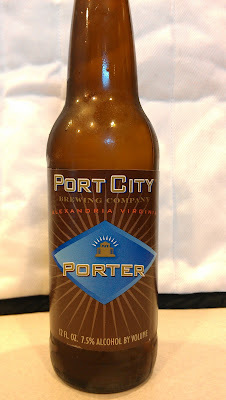 Port City is a new brewery out of Alexandria, VA, started in January 2011. They've grown quickly and are currently served by a very large number of restaurants in the DC metro area. DC has a lively beer scene, but has historically not been served all that well by local breweries. There were a handful of brewpubs such as Capital City Brewing, District Chophouse, and Rockbottom, but few breweries that distributed other than Dogfish Head (which has a handful of their Ale Houses in the area). Recently there’s been a number of breweries that have cropped up in the DC area, such as DC Brau, Chocolate City Brewing, and Port City Brewing. After tasting all their beers recently at their tasting room, the Porter was my favorite and that’s what I’m reviewing today. The beer pours a dark black, that is completely opaque except at the edges where some light starts to come through. A minimal tan head sits atop the beer. There are a lot of roasty characteristics in the aroma, particularly chocolate and coffee, cut with a nice malty, bready aroma as well. The taste follows through from the aroma, continuing the malty notes from the aroma. Most porters leave me feeling like I just drank a watered down stout, which really isn’t something I’m going for normally. 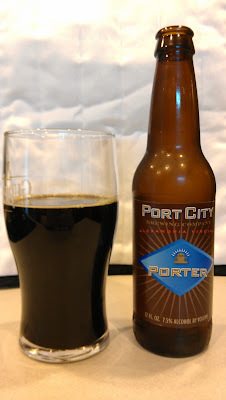 However, the Port City Porter has a nice hop profile from the addition of Magnum and Fuggles hops to give it a life of its own. There’s a nice long finish that continues on much longer than the typical porter, which is primarily due to its hop character. It starts out well-balanced, gets a bit hoppy after a bit, and then evens out, with almost a bit of mineral flavor at the end of the palate, which luckily isn’t very strong. Overall, a well-crafted beer that has a nice malt character balanced with just enough hops. Distribution is currently limited and was recently only in DC and Virginia. Since the beginning of the year they’ve expanded to North Carolina and Maryland; they may have been distributing to Maryland longer, not certain. Whether or not you’re a fan of porter, you should check out this beer if you get the chance, it may change your mind about porter (as it did mine).